One component polyurethane paint of advanced technology, modified with silanes. It creates a highly non stick surface that prevents the adhesion of any paint on it. It creates a flexible, resilient, sealing and waterproofing non stick surface, resistant to any type of graffiti, spray paint, permanent markers etc. Suitable for coating surfaces made of concrete and plaster, drywall, and cement boards, chipboard, as well as asbestos cement sheets, finished concrete and wood, metal etc. 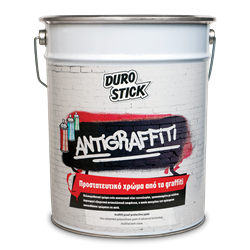 As white or colored paint, DUROSTICK ANTIGRAFFITI protects public and private buildings, schools (doors, railings), universities, stadiums, bridges, yards, building facades, even children rooms from permanent markers, pens, pencil etc. Apply it on new and/or existing sound surfaces painted with acrylic or alkyd paints. Its strong adhesion and the durable membrane its application creates (available to 11 matte colors), makes it an ideal way of protection and decoration. It remains unaffected even after consecutive cleanings using the special purpose cleaner for graffiti D-19 GRAFFITI REMOVER of DUROSTICK. Easily recoated with the same product without priming. 1lt/3m² for 3 coats of sufficient antigraffiti protection, depending on the application substrate.